3pm – Suite 1209 – UFO6 book launch! Friday, 5pm-7pm – Suite 1209 – UFO5 and Humanity 2.0 anthologies launch party! There will be refreshments served including the real Brooklyn bagels, so definitely come by this one! Link to my schedule at Capclave official page. I had three boxes of UFO4 books ship directly to the hotel so we’d have them in time for Capclave! My first time holding one of those babies will be tomorrow. You can be among the very first to get your hands on it as well as receive two free e-books: Funny Science Fiction and H. G. Wells: Secret Agent. That’s right, free. I will give those two e-books to everyone who attends the launch party. The launch party will take place at Capclave, in the Gaighersburg Hilton Hotel Suite 1209 this Saturday 5pm-7pm. Authors Fran Wilde, Lawrence B. Schoen and Andrew Kaye will be on hand to read from their works published in UFO and Funny Science Fiction volumes. Copy editor Elektra Hammond and I will talk about the editorial side of things at UFO and, of course, answer any questions folks might have. And there will be books! Traditionally, publishers gave authors an advance on royalties in exchange for the completed manuscript. Today, some writers are receiving alternate revenue streams including crowdfunding of anthologies and novels in advance by the public, serialization in which the author releases a chapter (or story) as long as readers continue to fund it, and electronic self-publishing. What methods have you used and what works? What new methods do you see in the future? How will this change the creation of books? Many non-English countries get much of their science fiction in translation. And English readers are finally being given access to more Chinese, Japanese and other non-English works. Why is this happening now? What are some of the special challenges with translating genre works? How do translators cope with invented words and concepts? What about different storytelling methods and literary techniques? Traditionally, most fantasy has been based on Western folklore, usually with a medieval-inspired setting. However, alternative settings and concepts are becoming more common with writers mining Asian, African, Native American, and Middle Eastern sources. What writers do this most effectively? How do you decide what traditions/concepts to adopt and how do research/use them? Is it cultural appropriation when writers incorporate themes from other traditions, and how do you so appropriately? The WSFA Small Press Award winner will be announced. The Guest of Honor Gifts will also be presented. What are the tips and tricks in writing humorous SF and fantasy? What can an author do to avoid the obvious pitfalls, and spot the not-so-obvious ones? How do you maintain a reputation for writing humorous SF or fantasy, and what is the benefit of doing so? DAW used to put out an anthology a month, now they seem much less common. What happened? Did the themes get too esoteric or were too many stories mediocre? Why are they more common among small press and Kickstarter books? Have online magazines taken their place? You’ve written the best thing ever. But the editor sent it back rejected. Now what? 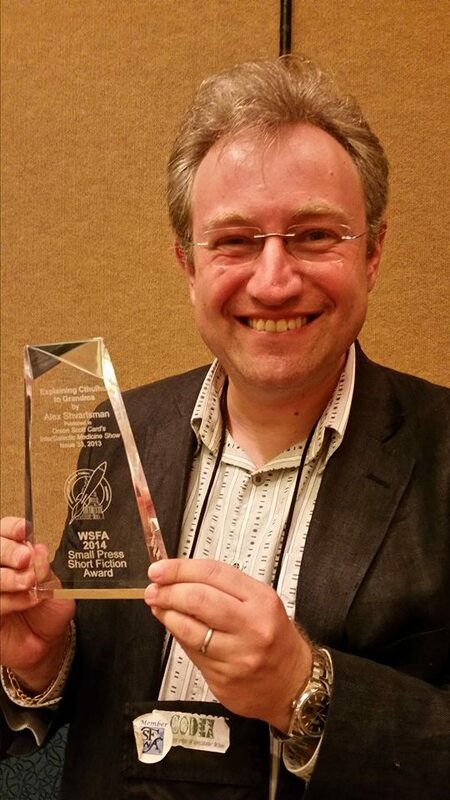 This Saturday, at the award ceremony held at Capclave, I won the WSFA Small Press Award for Short Fiction. I won it for “Explaining Cthulhu to Grandma,” which also makes this a win for Intergalactic Medicine Show, its editor Edmund Schubert and his staff, because they accepted and published this story! Small Press means everybody but the major publishers. So while Tor.com may be out, it still includes top-notch markets like Clarkesworld and Lightspeed (both of which had stories represented this year). The stories the board considers are also read blind, so the author’s name won’t sway them–which makes it more likely the award finalists would be selected on merit rather than popularity. I was very excited to be nominated but didn’t seriously expect to win. I mean, humorous short stories don’t win award any more often than comedies win the Oscars. I’m incredibly thrilled and very thankful to the WSFA members who proved me wrong and voted for my story. I was already having a great time at Capclave, which is rapidly becoming my favorite convention. It is relatively small and laser-focused on fiction (it doesn’t really have an anime track or a costuming track or much gaming, things that go hand-in-hand with science fiction conventions at most cons). Instead, you get a very distilled group of fans and professionals who love genre fiction. Not that fiction is the only subject of merit. This past weekend I got to talk psychology with Lawrence Schoen, geopolitical implications of the Russia/Ukraine conflict with Chuck Gannon, and whether it is sin or virtue that hypothetically makes a soul more attractive to Satan with Max Gladstone (true story!). There were many other conversations like this, and seeing old friends, and making new ones. But, you can imagine, how I was having even more fun, clutching at the award! When I got the nomination it took me about a week to come down. There’s no telling how long it will take now. That’s why I’m rambling incoherently in this blog post, instead of employing the level of snark you’re normally accustomed to. Seriously, I’m elated, and exhausted, and still a little sleep-deprived. But I wanted to post something before too long, and here it is. 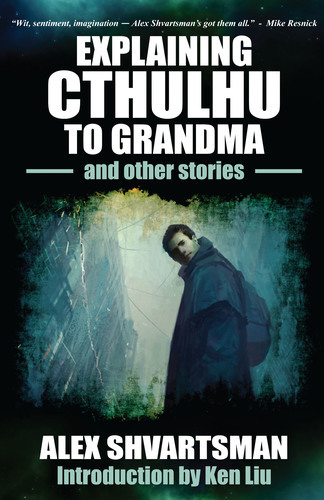 I should also add that “Explaining Cthulhu to Grandma” can still be read for free at IGMS, so if you haven’t read it yet, check it out! I’m back from the Baltimore Book Festival, but Capclave is right around the corner! Here are the panels, signings and other cool things where you can find me during this wonderful convention. If you are able to attend it, you really should. It’s easy to name the funny fantasy books, but what about the funny SF books and short stories? 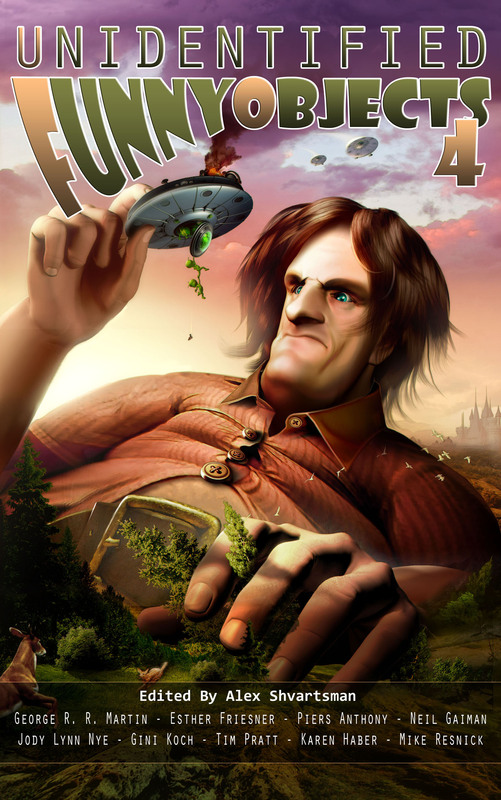 For instance, Unidentified Funny Objects was an entire anthology of funny SF.